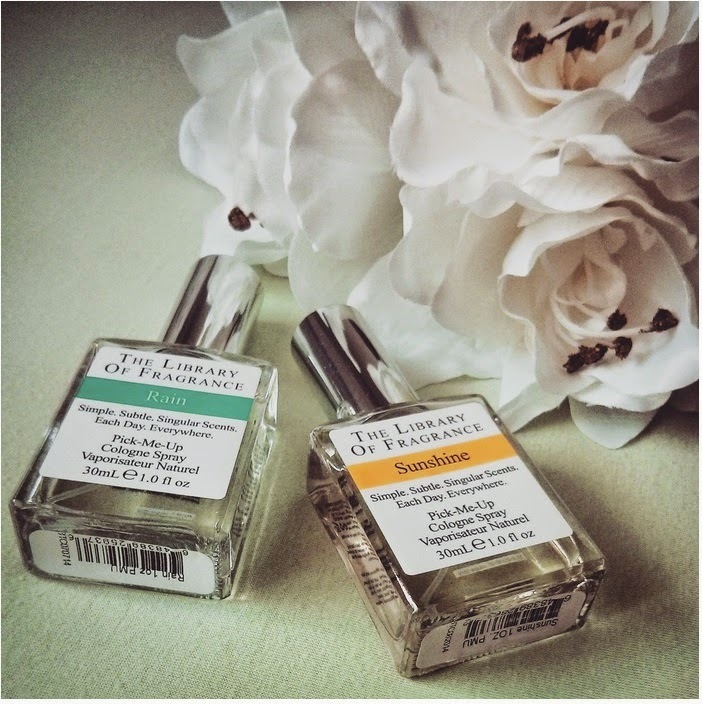 US brand Demeter Fragrance Library has launched their exclusive cologne perfume range in the UK last September. Under the name The Library of Fragrance, there are extraordinary and unusual scents such as Moonbeam, Thunderstorm, Wet Garden or Belgian Waffle for you to discover. The perfumes are sold at Boots for around £15 per bottle. Established on the US market since 1996, The Library of Fragrance now conquers the UK with their unique cologne sprays. 'Cologne' in the perfumery world is used to describe fragrance concentration and has little to do with the famous Cologne Water No 4711. The innovative concept is designed that each scent is unisex and aims to capture all 'the beautiful scents that surround us everyday' and take senses on a stimulating journey of imagination. The collection includes classic scents such as Vanilla, Cherry Blossom or Lavender, but there's also Ice Cream, Gingerbread and Chocolate Cookie. Unusual but interesting is Pizza, which is rumoured to be used by Italian restaurant chains to attract customers and influence their appetite. Saddle, Dirt, Fresh Laundry or Oud belong to the more random scents in the collection which is added through abstract ones like Music #7, Snow or Thunderstorm. The collection is as diverse as a bag of Bertie Botts Jelly Beans, of which you can find 28 best selling ones at Boots but there are another 101 waiting to be discovered online. Layering scents which compliment each other allow creating own compositions, which is another key feature of The Library of Fragrance manifold and dimensional perfumes. Sunshine and Rain* have kindly been sent to me for review and I had a bit of help with these, as my smell sense is rudimentary developed and not as accurate as a normal person's one. To me, rain has something of purity to it. It should be a crystal clear, a non-descriptive scent which is not too overpowering. Like water, it should have an airy note and a fresh cooling effect. 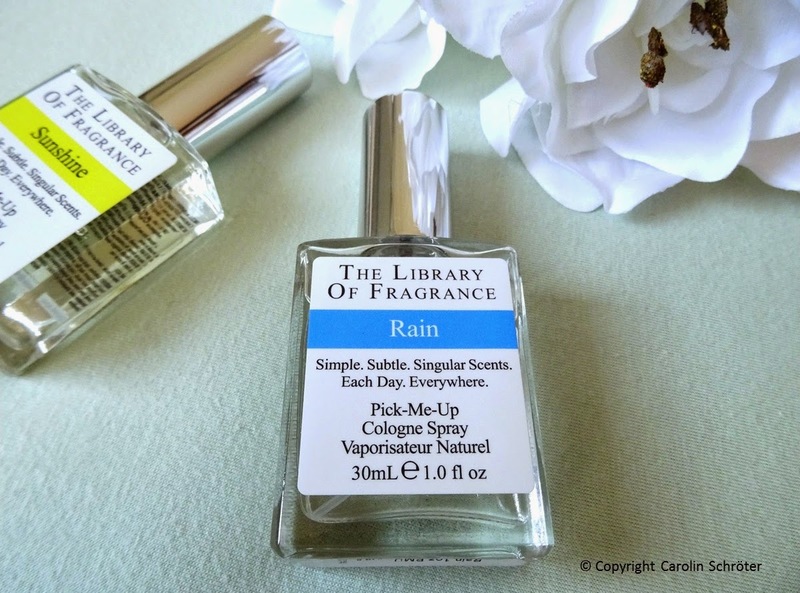 The scent Rain from The Library of Fragrance resembles the smell after a warm summery shower when the air is still hot and one can smell the damp soil. My two test person who kindly helped me with the colognes didn't identify Rain as rain. The fragrance smells pleasant and has fine notes. The headnote of this cologne contains orange and citrus which makes the smell slightly fruity, fresh and light. Both test person associated the smell with early summertime in the Mediterranean Sea area where they usually spend their holidays. Rain doesn't smell exactly how we imagined rain to smell, but it is a nice scent which makes you feel cosy in an instant. The cologne evaporates quickly with a longevity of under 2h. The typical smell of Sunshine to me is a mixture of sun lotion, sand, salty sea water and the smell of tanned skin after a long day at the beach. 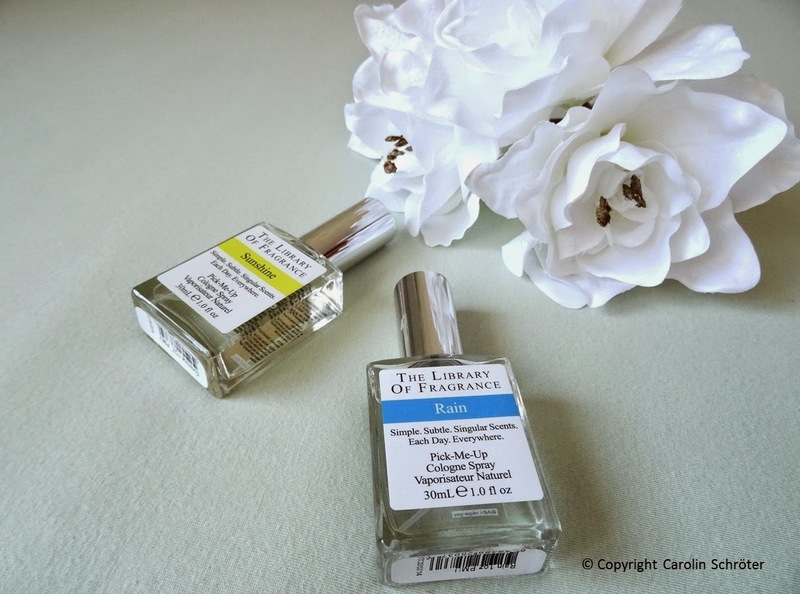 Sunshine from Library of Fragrance smells differently to my expectations but in a positive way. In comparison to Rain, Sunshine has a stronger note. It smells equally pleasant, fresh and gorgeous. The headnote has a hint of vanilla teamed up with citrus fruit that creates the holiday feeling, too. The longevity of this perfume is longer than Rain and my test person mentioned, the fragrance has a slight note of panthenol which she associates with a soothing effect. Combining the two fragrances creates an absolute wonderful smell which blends well with my natural scent. I think this is what the Rainbow might smell like. It's pleasant, fresh and not too overpowering which I really like about the colognes. They are delicate scents which make you feel good and positive. The Library of Fragrance is available at Boots and each bottle retails at £15. Thank you so much for reading today's post and I hope you'll be joining me on my next adventure. The Library of Fragrance has some unusual scents, which one would you pick up? Which scent would you like to bottle up?